Captured on on the coast of New Zealand’s rustic Cable Bay. Inspired by the raw beauty of the wild ocean, Wild Hearts featured a boatload of amazing New Zealand vendors including stationery from Just My Type, a lovely cake by Baked By Olivia and a gorgeous model Ashana Rengasamy whose hair and makeup were flawless thanks to Haircraft and KO Cosmetics. 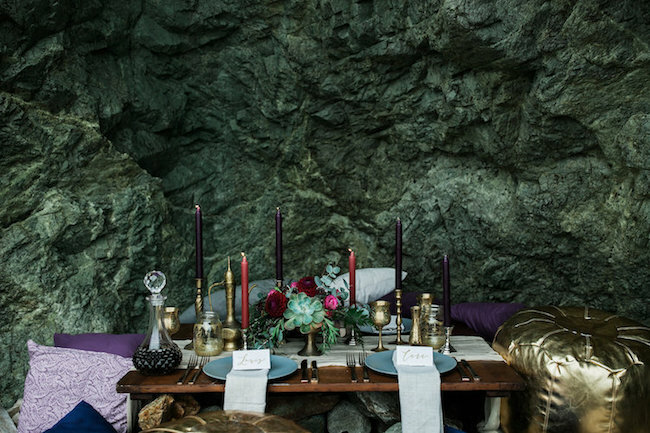 With a luxe gypsy-like spirit, she stands deep in the rocky cliffs, sporting faves Rue De Seine and Bride La Boheme, taking shelter from the rain. Below her is an exotic table setting adorned in a rich palette of Moroccan hues, mixed with accents of intricate gold patterns via Gold Wedding Hire and plum tinted blooms by legend florist Perfect Style. Styled by Myself and Samantha Gerard. Styling, concept and shoot management for Stock Image photography. 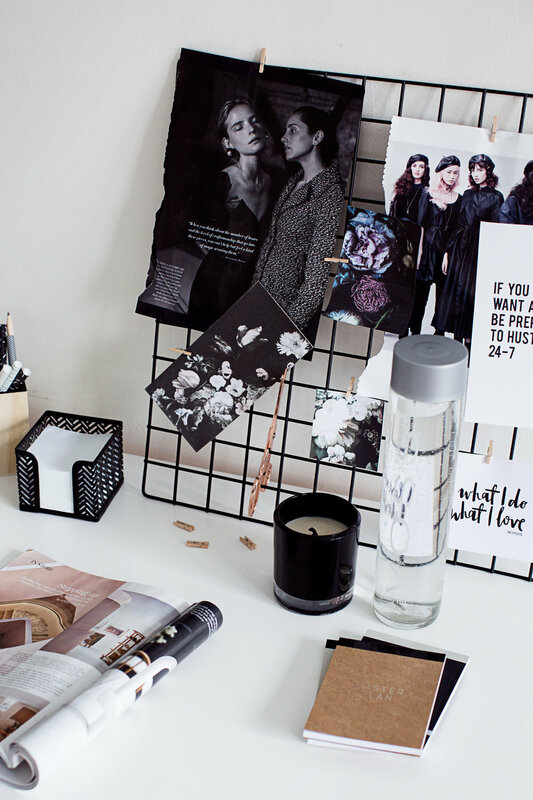 Inspired by dark hues, moody lighting an overall simplicity design. 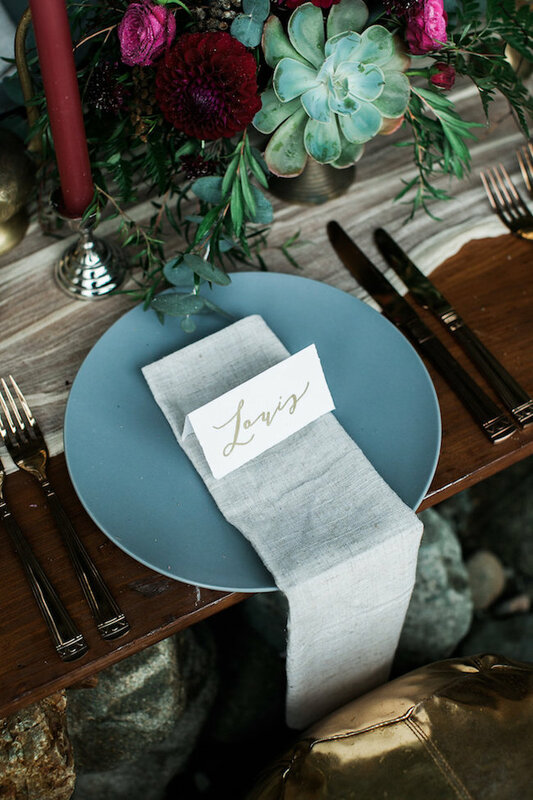 With the focus on capturing stock images that can be used for a wide range of wedding professionals with a focus on flat lays and creative workspaces. Showcasing an alternative selection of deep, brooding looks for the more adventurous, intense couple, with dark leather elements and simple, sleek designs. A lazy reception on lounges staged in candlelight and a cover of darkness, creating feelings of a romance that is secretive, wild, smouldering and dark. There’s a European countryside feel to this, with dark, brooding undertones incidentally linked with a passionate connection between bride and groom, whose garments speak of elegance and European simplicity and style. The olive green foliage of the floral arrangements and ceramics and Mediterranean food laying about the table bring back a feeling of endless summer afternoons that stretch into nights, of wandering through a Tuscan field, foraging and picking fruit as you go. The conversation around the dinner table and alfresco dining of everything that was harvested along the way connects day to night, where a new chapter of a relationship begins. Taking place at a simple yet stunning venue by way of High Church – a recently restored venue located next door to Brisbane’s CBD, I put together this gorgeous styled shoot offering up a boat load of wedding day inspiration, including desserts by Hansel & Gretel and The Bake Co and stationery by Coco Bride and Wishling & Co. Complementing the venue’s modern luxe style, Willow Tree Creative and Bella Bloom Floral Designs, having borrowed bits and pieces from LoveStruck Weddings, Moreton Hire, Covered Linen, Retro in the Rough and Gold Wedding Hire, dressed High Church in fresh greenery, stunning white florals and candles upon candles (we’re not kidding, they were everywhere). Captured by Juddric Photography and Laura Brain model Stacey looked lovely in a Georgia Young Couture gown, a Bride La Boheme headpiece, jewellery by Natalie Marie and with hair and makeup done by The Beauty Case. The food by Zen Catering, lighting by AVIdeas and men’s suit by Urbbana. 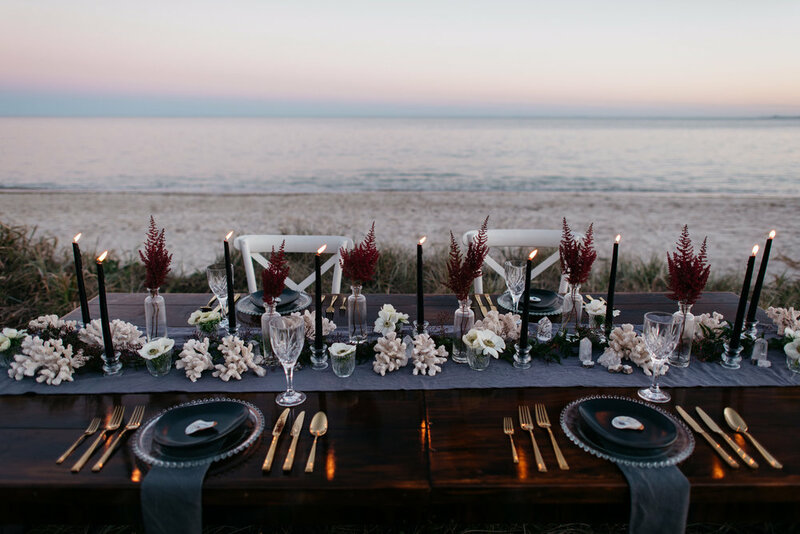 A secluded table, hidden aside the dunes is the perfect positioning for an elopement in style. 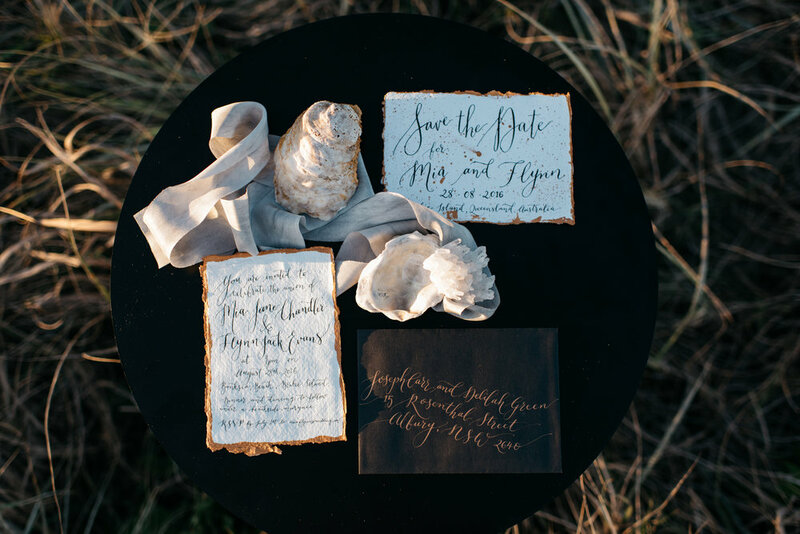 Inspired by muted and moody tones with a touch of bohemian, this shoot was captured at sunset on Bribie Island by Trent & Jessie Photography. Coaching and Mentoring for Wedding businesses - Planners and Stylists. Working one on one with coaching services to help you achieve your business goals.